Global brand design consultancy, Elmwood, has completed a radical redesign of Heineken’s oldest premium Mexican beer brand, Bohemia. Being the first premium beer in the country when it launched in 1905, the brand has become steeped in traditional values and heritage. However, Bohemia’s appeal aged with its customers. It needed to become aspirational once more with a fresh approach that could engage with a younger generation of beer lovers, while staying faithful to its existing consumers. Elmwood’s extensive immersion into the brand’s background and culture, highlighted a thirst amongst Mexican beer drinkers for a sophisticated and premium national brand to champion. This was a chance for Elmwood to revive Bohemia and create a brand that people of all generations would be proud to support. Throughout the creative thinking process, maintaining respect for the brand’s past was paramount, together with the need to conserve its authenticity. Elmwood focused on what makes Bohemia unique – it’s name. Something that is ‘Bohemian’ expresses itself in unexpected, authentic, creative and original ways. From here, Elmwood developed the brand’s new distinct point of view: The Bohemian Angle on Life: Taste with all your senses. Have an opinion, from a uniquely Mexican perspective. Be inspired by tradition, while always looking forward. In keeping with the new Bohemian point of view, Elmwood used marbled patterns to adorn the gold-foiled tops. Elmwood collaborated with Mexican lettering artists, Lettres, to redraw the Bohemia word marque. The task was to retain the distinctive character of the 'Bohemia' lettering but give it an authentic and contemporary Mexican flavour. The new marque celebrates the balance of perfection and passion that goes into the beer – the perfection is achieved through the consistent rhythmic uprights while the passion comes to life through the playful flicks that break out. The Emperor, who has been linked to the brand since its launch, remains, but with a refreshed look. Elmwood respectfully recrafted the proud figure in a contemporary style that shares a consistent visual DNA with the redrawn Bohemia word marque. Addressing issues of clarity and simplicity means he is now an impactful and proud icon, not just an illustration. 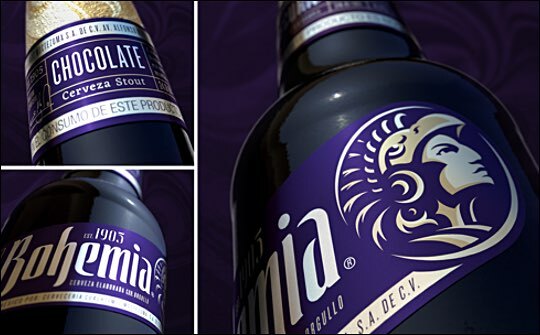 A dark and rich colour palette was chosen to convey the depth of flavour in the beers. Greg Taylor, global provocation director at Elmwood, says: “Bohemia is a truly authentic Mexican brand that has huge opportunity to appeal to the mass market – young and older. We needed to bring Bohemia back and put it in the minds of social, passionate Mexican beer lovers once again. Gisselle Villarreal, brand manager, Bohemia and Affligem adds: “The brief to bring Mexico’s oldest premium beer brand back into the minds of the consumer, with a radical new redesign, wasn’t an easy one. We knew it needed an agency that could really get under the skin of the brand as well as the culture it lives in. Elmwood’s approach, coupled with the team’s exemplary creativity, made them the perfect extension of our brand team. We knew they could deliver what we needed, and they have.